Magic with a distinctive oriental twist. 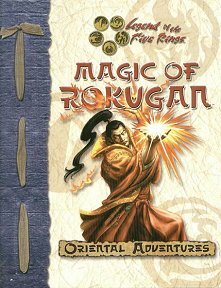 Publisher's blurb: "The magic of Rokugan is unlike that of other campaign worlds - each spell, each magic item has a life of its own. Each bit of magic contains a spirit with its own will and desires. Magic of Rokugan not only introduces a great number of new magic items and spells usable with any d20 System campaign, but also contains many new optional rules for 'awakened' magic items. New item creation feats and shugenja prestige classes are also included. Fans of the Legend of the Five Rings collectible card game or role-playing game will certainly recognize many of these updated items, but there are a number of new surprises as well."